Some pond scums are showing up after heavy rain from the tropical storm.. There was some in the pond behind our house as well. These blooms usually appear during the summer and fall. We do have to beware of blue-green algal blooms (cyanobacteria). These produce toxins that can be lethal to most fish and livestock. 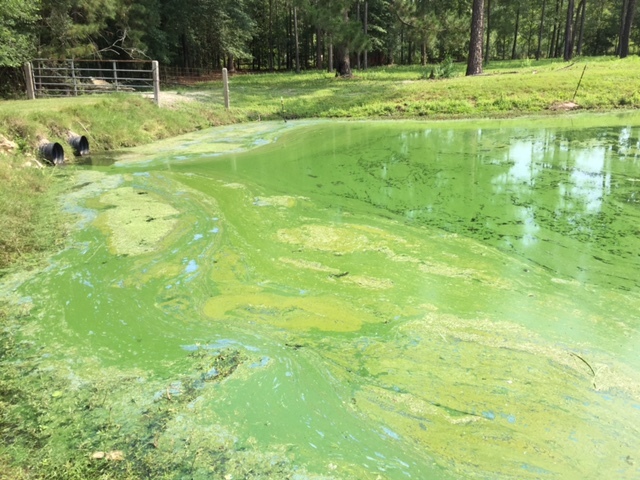 Other aquatic weeds called pond scum are duckweeds and watermeal, Euglena, diatom blooms, filamentous algae, bacterial, protozoan, and zooplankton scums. This photo is likely blue green algae scum which was sent to me last week. 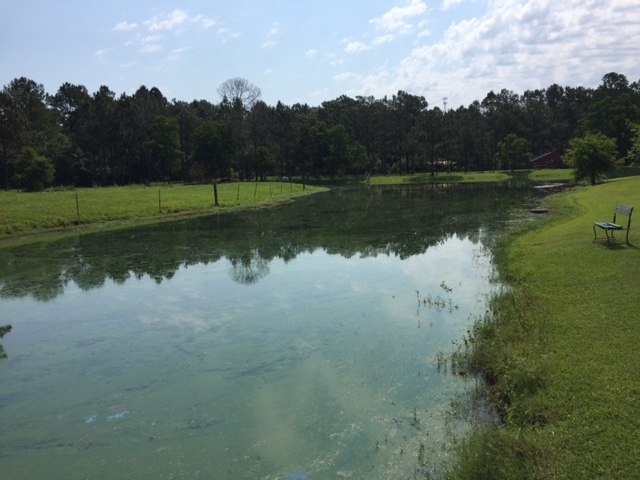 UGA Extension Aquatic Scientist Dr. Gary Burtle says, “The hot temperatures make most algaecide applications dangerous to the fish due to possible oxygen depletion. However, low dose applications of copper may thin this bloom. Try one quart to one half gallon of cutrine plus per surface acre. Then repeat each week to thin the bloom. That would be about 0.2 lb to 0.4 pounds of copper per surface acre. Dilute 1:10 in water for application to the scum.